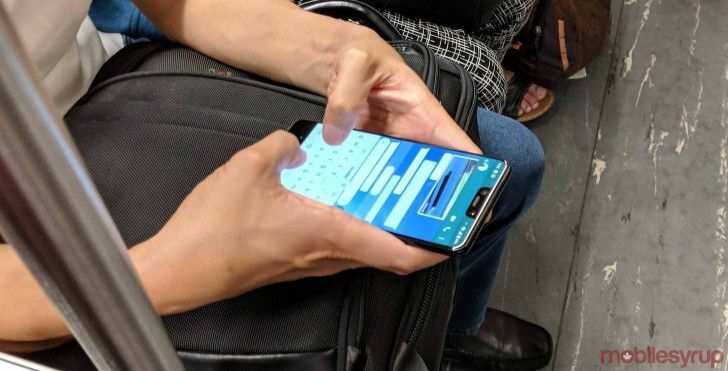 The Google Pixel 3 XL has leaked in a revealing set of photos taken apparently in public which show off the new smartphone and its mighty notch screen. The new images comes from Canadian site MobileSyrup which has apparently spotted a Google employee using the Pixel 3 XL out and about. The pictures were sent in by a reader who apparently snapped them on a subway in Toronto. You may notice it appears to be the same hands and bag from a leak last week – suggesting these are planned by Google, or at least by that employee. That or they're just on the same train with the same person back to snap it again. What the photos reveal, from front and back angles, is that new notch. Google was already expected to introduce a notch screen on the new Pixel 3 XL after it updated Android Pie with support for just that feature. As you can see this one is a particularly deep notch, as opposed to the thinner and wider one on the iPhone X. The source claims the notch features two cameras and a speaker but it seems more likely this is a single lens camera and a sensor. Since the rear should feature a single lens camera it would be odd to go for a double in the front. Of course, all that said, a double front-facing selfie camera setup could be useful for face unlocking – so the Pixel 3 XL may get the double on at least one side of the phone. Google is expected to launch the Pixel 3 XL in October.